pledgeperks is launching in Palm Harbor. 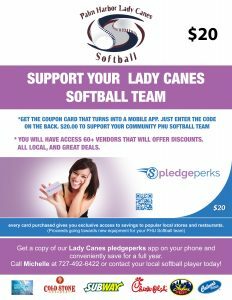 The app is actively being offered by the Palm Harbor University softball team. Go lady canes! Please connect with them and get a copy or pledgeperks today. I think you so much we enjoyed this partnership. Questions on how to get your offer into pledgeperks? Would you like a great fundraising option? Please call us at 727-776-9248.